Since my duo post partner Rachel and I will be looking at its film adaptation later in the week, the following reprise post I did awhile back will have to do while I’m suffering from PTBD1. Originally hosted over at Kaye Wilkinson Barley’s Meandering and Muses site, the author of the Whimsey novel recently had a Small Press & Self-Published event for her first novel. It now has an audiobook version, too. Way to go, Kaye! 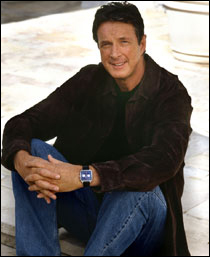 The late author Michael Crichton, besides being a very successful writer with unique perspective, was one of the first progenitors of the hybrid genre known as the techno-thriller. In many ways, he laid the groundwork with that class of fiction, which I found fascinating in books as a teen (a period oh so long ago, it seems). 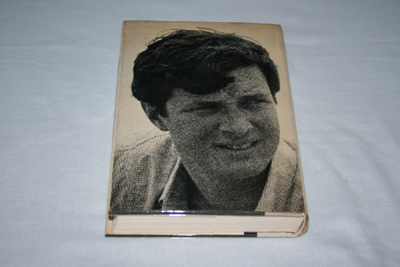 Though I credit my mother for her influence in making me a reader of books, it was with Crichton and his early novels where I found some of my first tangible traction in really enjoying the experience of words on a page. Yes, I read books in junior and senior high school. There was no way to get out of that (and Lord knows, I tried). Book reports were the accursed bane of my scholastic existence back then. Whatever title was part of the curriculum, no matter whatever junior or senior high school year I was in, had to be endured and trudged through. ‘Fun’ hadn’t entered the lexicon when it came to reading, at that point. For me, at that age, reading represented work. Whatever enjoyment came of it was solely reserved for when the assignment was over. Or, so I thought back then. It seemed only a few of the assigned materials held much for me (or it could be better said, I didn’t hold much for the material). The irony of me saying, ‘it’s academic’ at that point, was not lost on me here. I’m sure I, and a couple of my school counselors, would have found where I ended up more than a bit startling, along with my undeveloped reading habits. Few things got through the hormone haze in my life at the time, not surprisingly. Through it all, there was one day in particular which changed my outlook with the written word. It remains a high point of my teen years, and an event that holds unique sway for me. Michael Crichton wrote the first book I read – no that’s not right… consumed is better — in a one-day period. I’ve come to believe for every avid reader out there, early in their genesis, they collided, or somehow merged with… hell, let’s just say plunged into, that one specific book. Like no other before it, this was the paper- or hardback that somehow ended up before your eyes and wouldn’t allow you a breath till the very last page was turned. For me, that moment came on a cool day in early 1970. 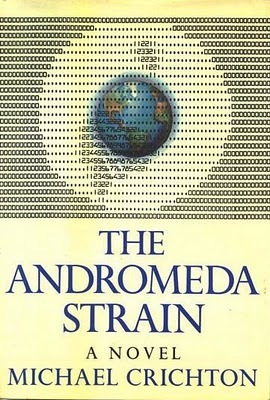 And the work that became the first black hole readership experience was Mr. Crichton’s début novel (at least under his real name), The Andromeda Strain. I was bored to tears being home – of course, not enough to get me packing back to school, mind you. It’s almost an axiom that boredom and ‘teenager’ don’t mix well. Some of the worst ideas come from that… but I digress. So, with mi abuelita away for her monthly doctor’s appointment, I went looking for something (meaning anything other than school work) to peruse. When I got to my uncle’s shelves, it was this 1969 hardcover that caught my eye. Scanning the back cover sparked something… maybe it was the premise or the unknown that got to me, but the hook was in. I started The Andromeda Strain around 10:30 that morning, and couldn’t believe the pace of it all (the book’s and my own). It was the combination of curiosity, fascination, and building suspense with the material that held me. Today, this type of thriller is a staple for readers, almost to the point of being formulaic. But back then? Readers hadn’t seen this come down the pike before. And when my grandmother returned that afternoon, all I remember was her brief touch on my head for a fever as she walked past and returned to her kitchen. I think I said “hi“, or something… but I didn’t look up. I finished the novel just after 11 PM that night. I did take fitful breaks that day, but the damn thing kept pulling me back in. I’d put the book down for a moment, then found it back in my hands somehow. I swear, that’s the way it was… a day now so long ago. If my wife scrutinizes this, she’s gonna complain that I’m being wistful once more. It’s a habit of mine. She’s the one who tagged me with having the “nostalgic gene” (something she says she does not possess). Luckily for me, I’ve managed to pass some of this down to my kids. My wife and I are long-time readers, and if our biggest complaint is making sure our children don’t stay up too late because they’re up with flashlights reading something compulsively good, then that’s the least of our problems. What book was it for you? I’m not big on books, but I remember reading Catcher in the Rye in one go. As for the Andromeda Strain, I just happened to have seen the movie based on this last week and thought it was very entertaining. Have you seen it? Yeah, I think ‘Catcher in the Rye’ was like that for my son. And yes, I’ve seen both the Robert Wise movie of the same, and the 2008 cable miniseries. They were both entertaining. But, they didn’t hit me like this book did in ’70. Thanks, Nostra. Fortunately, my parents got to me before the school system did when it came to books. While I remember reading and loathing many assigned texts in school, I also remember checking books out of the library and reading them for fun. I read any number of young adult books through in one go… the Three Investigators series comes readily to mind, because I remember once being amazed that I’d finished a book (The Mystery of the Invisible Dog) in only a couple hours. I still got that revelatory moment, though. It came my 8th grade year, when I had started wandering over to the adult section of the public library. I’d read some Xanth and Dragonlance, and was thus starting to get into sci-fi and fantasy. Just a few things in the junior high library, but the public library had a full aisle of hardbacks in the genre, and a few shelves of paperbacks. I perused the shelves, not knowing where to begin… and always having had a quirk regarding odd names, started at the end. “Zelazny”. A name with two z’s is just amusing to a weird little kid, so I picked up Nine Princes in Amber. I was already used to reading books for fun, but this was the book that really demonstrated to me that a book could be a page turner not just because of the plot, but because of the cleverness of the writing, how the author turns a phrase. It taught me that the hero didn’t always have to be completely virtuous. It taught me that a book can dump the reader straight into a confusing situation without building up to it. It also taught me to anticipate books (at the time, only 8 of the eventual 10 books were published). The series taught me that plots can be more complex than they appear, and that a masterful plot twist can be planned out hundreds of pages in advance. And it taught me that writing itself can be complex, with a few different writing styles in the series itself… I would read Zelazny’s other novels, and sometimes I wouldn’t get them right away. But I’d go back to them a few months later, and it would suddenly “click”. He’s still my favorite author. Amber is still my favorite series. That’s simply a wonderful recollection, Morgan. A marvelous connection you’ve conveyed, my friend. I think it’s left a great and substantial mark not only on your reading, but on your writing, too. Thanks so much for sharing it here :-). I’d read Creighton’s hard cover novel about two years before the film came out. A decently quick day and a half read. I was impressed with all the cool tech. And that the Wildfire lab was based on the Army’s underground, negatively pressured Bio-Chem lab at Ft. Detrick. Out beyond Baltimore, MD. The film stayed surprisingly true to Creighton’s work. I especially liked the adult cast, waldoes, sterile suites, air locks and disposable paper jumpsuits. Sci-Fi is always better when it isn’t dumbed down. And “The Andromeda Strain” is a smart film that has aged surprisingly well. Oh, yeah. I’m with you, Kevin. And ‘The Andromeda Strain’ came flooding back to me in the mid-90s when I latched on to Richard Preston’s non-fiction bio-thriller, ‘The Hot Zone’, where Ft. Detrick played a vital role. And Robert Wise’s adaptation was a very good one. I’d agree, like the novel, it didn’t dumb anything down and remains a smart, underrated film. Many thanks, my friend.